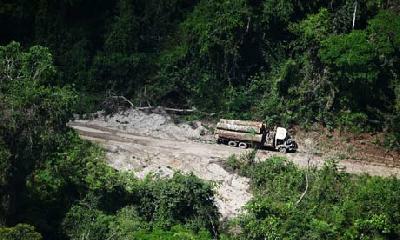 Brazilian activists who inform on illegal loggers laying waste to the rainforests can expect a visit from the gunmen. A single shot to the temple was Mouth Organ John's reward for spilling the beans. His friend, Junior José Guerra, fared only marginally better. Guerra's prize for speaking out against the illegal loggers laying waste to the greatest tropical rainforest on Earth? A broken home, two petrified children and an uncertain exile from a life he had spent years building in the Brazilian Amazon. "I can't go back," said Guerra, one of the Amazon's newest environmental refugees, three months after his friend's brutal murder forced him, his wife and his two children into hiding. "We've been told that they are trying to find out where I am. The situation is very complicated." Mouth Organ John, 55, and Guerra, 38, lived along the BR-163, a remote and treacherous highway that cuts from north to south through the Amazon state of Para. They were migrants from Brazil's south who came in search of a better life. Neither man was a card-carrying environmentalist and both had reportedly been previously involved with environmental crimes. Still, they opted to commit something widely considered a cardinal sin in this isolated corner of Brazil – they informed on criminals allegedly making millions from the illegal harvesting of ipê trees from conservation units in a corner of the Amazon known as the Terra do Meio, or Middle Land. In a region often compared to the Wild West, betraying those pillaging the rainforest all too often leads to a coffin or to exile. Mouth Organ John, an amateur musician and mechanic whose real name was João Chupel Primo, met his fate first. Last October, he and Guerra handed the authorities a dossier outlining the alleged activities of illegal loggers and land-grabbers in the region. Within days two men appeared at Primo's workshop in the city of Itaituba and shot him dead. A bloody photograph of his corpse, laid out on a mortician's slab, made a local tabloid. "There are signs this was an execution," the local police chief, José Dias, told the paper. Guerra escaped death, but he too lost his life. Told of his friend's murder, he locked himself indoors, clutching a shotgun to ward off the gunmen. The next day, he was spirited out of town by federal police. Since then Guerra has embarked on a lonely pilgrimage across Brazil, journeying thousands of miles in search of support and safety. He became the latest Amazonian exile – people forced into self-imposed hiding or police protection because of their stance against those destroying the environment. "They will order the murder of anyone who reports them [to authorities]," Guerra said this week over a crackly phone line from his latest hideout. "We thought that … if we reported these crimes they [the government] would do something … But actually João was murdered as a result." In June Brazil will host the Rio+20 United Nations conference on sustainable development. World leaders will gather in Rio to debate how to reconcile economic development with environmental conservation and social inclusion. Brazil will be able to trumpet advances in its battle against deforestation – in December the government claimed Amazon destruction had fallen to its lowest level in 23 years. But the continuing threats to environmental activists represent a major blot on its environment credentials. "What is at stake … is the government's ability to protect its forests and its people," said Eliane Brum, a Brazilian journalist who has won numerous awards for her dispatches from the Amazon. 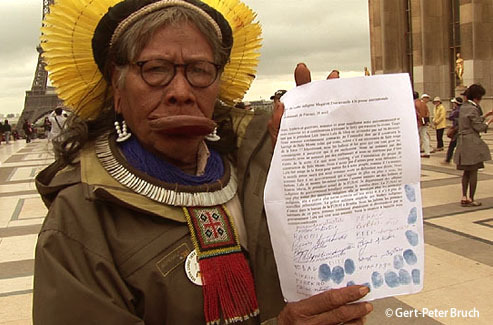 "If nothing is done … the government will be demoralised on the eve of Rio+20." Guerra is far from the first person to be forced into exile for opposing the destruction. According to government figures 49 "human rights defenders" are currently under protection in Para state, while another 36 witnesses are also receiving protection. Last year, after the high-profile murders of Amazon activists José Cláudio Ribeiro da Silva and Maria do Espirito Santo, two local families were flown into hiding and given new identities in a distant corner of Brazil. Like Primo and Guerra, they knew too much. In the neighbouring state of Amazonas, where activists say nearly 50 people run an imminent risk of assassination, rural leader Nilcilene Miguel de Lima was forced to flee her home. "The gunmen and the killers are the ones who should be in prison, but it's me who is under arrest," she told the O Eco website after an attempt on her life drove her into exile. José Batista Gonçalves Afonso, a veteran Amazon human rights lawyer, said he had seen "countless" families forced into exile for fear of being assassinated. He blamed the situation on "the state's inefficiency in investigating threats and providing security". "The ones who should leave are the gunmen and their bosses … but it is the workers who end up being punished because of government inertia," he said. Brum, who brought Guerra's plight to the public eye, said his situation reinforced the idea that "it is not worth informing on organised crime, because informing means dying." "Is it possible that after what has happened … others will have the courage to rebel and report organised crime in the Amazon?" she asked. Ramais de Castro Silveira, Brazil's secretary of state for human rights, described Guerra's situation as "extremely serious" and said his concerns were "legitimate". But Guerra had not been included in a federal protection programme for human rights defenders because he did not qualify as a human rights activist, he said. Silveira admitted there was no specific protection for environmental activists, but said Guerra had refused a place in a witness protection scheme in another part of Brazil because of its "restrictions". "It is my right to live there," Guerra said. "I risked my life to report these crimes, but now I have to leave?" Silveira said those behind Primo's murder and Guerra's exile would be caught "in the short to medium term". "I don't believe the drama they have gone through and are going through has been in vain," he said. For now, life on the run is taking a toll on Guerra, his wife and sons, whom he has not been able to enrol in school. "We have to stay strong and to try and cope with all this," he said. "It's the only way."